Between packing up my office, moving to a new university, and participating in the protests related to Trayvon Martin’s murder, I missed an important diss-able moment here: doggin out PAULA DEEN. Black folk on twitter kept me afloat during that time and I’m not even on twitter. And in case anyone was confused about this, yes, we are laughing AT Paula Deen, not with her. Everything about her— her dishes, her health, her children, her Bubba— got publicly dissed on every social network site imaginable. It was the most lovely way to treat a white supremacist. The memes alone inspire deep pride for me. It made it that much easier to dismiss all those “liberals” saying black people were too sensitive or blowing things out of proportion. If my recent trip to Savannah, Georgia is any indication, then it seems safe to say that social networking brought down Deen: every time I passed a Paula Deen Tour Bus, it was E-M-P-T-Y! Personally, I think all of those very public disses of Paula Deen should be a model for how we treat anyone who thinks we should dress as/be slaves, serve them sweet potato pie (and everything else), and/or maintain confusion about the N-bomb. Descriptions of Deen’s racism are hardly over, including the ongoing testimonies of black women in the recent NYTimes who Deen exploited while thiefing their recipes and expertise as cooks. It seems like Deen’s empire really was run like a plantation: the exploitation of black labor, ingenuity, and skill while she sat back, rich and fat, grinning for the public as if she had herself pioneered something. A plantation, indeed. Like I said, Black Twitter was a thing of beauty, but my heart goes out to AfricanoBoi who gave the best commentary on Paula Deen yet! For all non-black folk, no, you can not laugh at this but you do get to hear how WE HEAR white supremacy. For all black folk: yes, you can roll all over the floor and laugh your hearts away!!! I know I still am. Sometimes, laughing back and talking back go hand-in-hand because, given all that is coming to light about Deen’s labor practices, AfricanoBoi might not be exaggerating that much. My graduate advisor, Suzanne Carothers, is one of the most thoughtful pedagogues that I know, someone who thinks about the education of pre-school and elementary black children in strikingly alternative and radical ways. In a recent conversation, she reminded me that black children’s role on slave plantations was to take care of white children close in age group. Until that conversation, I had not thought of the wide-ranging ramifications of this. 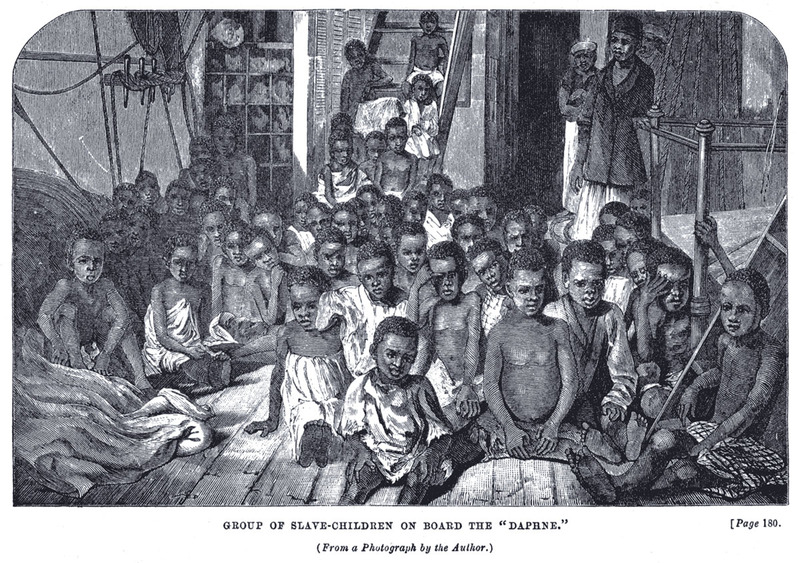 It immediately triggered the countless histories and narratives I have read of African American adults explaining how they learned to read and write in slavery via the required chores they had to perform as children: carry white children’s books for them to school; stand outside the schoolroom and wait for white children to finish school and carry their things home; stand in attention while white children learned or played, eagerly awaiting a command from them. We know from the archives that black children used these moments to eavesdrop on school lessons, learn the alphabet, and trick white kids in disseminating the information white children had learned. We have not talked enough though about what this relationship between white children and black children as learners meant for the epistemological construction of plantation life. What is most interesting to me is the way in which Carothers marks this relationship as central to classrooms today: black children are still always expected to teach and help white children understand race or African American lives. In my teaching context, I am talking about those moments in the college classroom where the issue of race or black history comes up and all the white people in the classroom turn to look at the one (or two or three) black student(s) in the room. Or, there is the moment where a certain theory or issue comes up that is so obviously racialized, but it is up to that one (or two or three) black student(s) in the room to point it out, not the teacher’s role, and the room (or digital interface), of course, just goes dead silent. This seems like a story every black college graduate I know can tell and you can read about this kind of psychic warfare in countless educational accounts of black students’ experiences in schools. I don’t think, however, we are often inclined to call and link these experiences of black students to slavery in the way Carothers has for me: these kind of moments in classrooms are simply the vestige of a plantation economy of knowledge and learning in the context of white dominance. That kind of framework pushes me to think about race and classrooms in a whole different way and question how, when, and where white children are made dominant. I would like to hold myself accountable to offering black students something different from this “plantation economy of knowledge and learning in the context of white dominance.” What this means concretely, for instance, right now is that in the first three weeks of my current class, my students do print-based writing (there is an informal writing assignment due each class) that they can email or hand in to ONLY me. They are not posting their stuff online anywhere for the class or the world to read. I need to see, hear, encounter their racial ideologies first and take them on. I need to see who and what I am working with first. I especially need to see the work we will need to do as a classroom before we can educate people outside of our classroom. It is a seeming contradiction that so much, if not ALL, of my class depends on digital spaces; yet my students are not writing in the same open, digital spaces that contains the class materials (not yet). To put it most simply: NO STUDENT in my class will be waxing on online with anti-black comments. I am thinking here about my first semester teaching graduate classes where white male graduate students wrote quite freely in their weekly seminar papers about how lazy black people are and how slutty black women are. I deal with that quite readily and willingly on my own, and pretty regularly (and have been able to count on white faculty not noticing or caring). In my second year as an assistant professor, I encountered a white male student who had text-messaged sexually vile statements to the women of color in one of his classes where students were required to put their numbers on a class-distributed phone list. When I reported his behavior, it was clear to me that I alone— the only untenured member of the department of the time— had to work with the women to file a complaint and would have to deal with the student alone in my own class in a way that would make sure he didn’t pass my class and, therefore, lose his position in the program— a program that certified teachers to work in urban high schools. Like I said, I KNOW I am alone on all of this but I am also very clear: such students will not unleash racial violence and distribute their texts online in digitized classroom-discussion boards or in public online spaces as part of the work that happens in my class. Not. On. My. Watch. From my perspective, teachers need to be held accountable for such digital texts when white men such as the ones I described go online with this stuff. It is not the job of black students in the class to challenge them, to help them, to push them, all of which, as Carothers helped me to see, is a kind of ongoing plantation logic and relationship system. Despite the liberalism that would say everyone is speaking their own minds, it is not a democracy when black people are being dehumanized. I am not talking about the alternative liberal universe either where we don’t talk about race at all (hence, no one noticing the ideas of white male students I am talking about except me). What I am talking about here is a kind of AfroDigital consciousness that works against these public spaces when the violence of racism is fully alive in classrooms. No teacher’s classroom and no teacher’s assignment are ever innocent! My class this semester always enrolls a large number of black female students, probably more than any other class on the campus (I learned yesterday that mine is the only class about black women). I will not expose them to students who espouse anti-black/anti-black-woman diatribes on class digital, discussion boards. I know the damage that does given how many students of color come to me to talk about exactly such experiences in their other classes (I won’t even tell you how many white students have dropped my classes, no matter the subject, after the first day seeing me and seeing my syllabus). Black women get enough of this kind of hostility elsewhere; they don’t need more of it in my classroom too. As we move through the semester, I strategically choose when and where students will go public with their writing—whether with the class or with the wider digital universe. I think this is especially relevant given a kind of liberalist mantra in my field about the general goodness of all, real audiences when students write digital texts. I ain’t tryna hear that. I experience writing and audience in very different ways. I want to see teachers (and in my field, this means mostly white teachers) held accountable for the epistemological violence their students inflict on black bodies. I am not suggesting that it is the fault of teachers when their students espouse racism but when they do that espousing within a public assignment that is teacher-required, then teachers need to be held accountable. In fact, I think it is a crucial aspect of an AfroDigital pedagogy to further this kind of accountability. It ain’t democratic to let students say and do racism; but we can surely ensure democracy by checking them and their teachers on it. An AfroDigital pedagogy does not comfort and take care of white children on our newest plantations in ways that maintain racialized hierarchies. It must achieve the opposite.